Carte des Cercles du Haut et du Bas Rhin ou se trouvent dans le premier, le Duche de Deux-Ponts, les Echeves de Worms, et de Spire, les Etats de Nassau et de Hesse, les Comtes de Hanaw, de Solms, d'Isenburg, les Abbeyes de Fulde et d'Hirchfeld &c., et dans le second, les Electorats de Mayence, de Treves, de Cologne, et le Palatinat du Rhin, avec leurs enclaves. 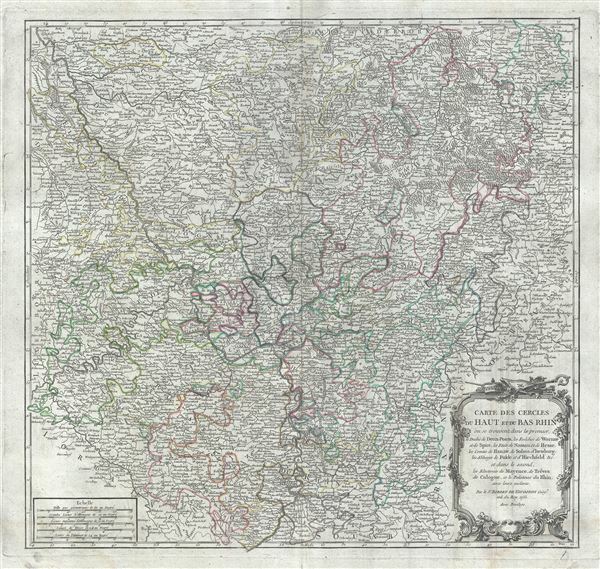 This is a scarce 1753 map of the Upper Rhine and Lower Rhine regions in western Germany by Robert de Vaugondy. It covers from Saarbrucken north to Paderborn and east as far as Muhlhausen. The cities of Frankfurt, Cologne, Mainz, Bonn and Dusseldorf are noted. The entire region is depicted in extraordinary detailed, offering both topographical and political information, with forests and mountains beautifully rendered in profile. This area, known as Rhineland-Palatinate, is known for its fine Riesling wines and is the world leader in sparkling wines. The 'circles' of Germany are the 'imperial circles,' administrative units created for tax and defense purposes by the Holy Roman Empire, of which these areas were a part. The Napoleonic Wars would, of course, dissolve the Holy Roman Empire and lead to the consolidation of Germany in 1871. > This map was originally engraved by Catherine Haussard, one of the few female engravers active in Paris during the 18th century. A beautiful title cartouche adorns the lower right quadrant of the map. Issued in the 1757 issue of the Atlas Universal. The Atlas Universal was one of the first atlases based upon actual surveys. Therefore, this map is highly accurate (for the period) and has most contemporary town names correct, though historic names are, in many cases, incorrect or omitted. Very good. Minor wear and toning along original centerfold. Original platemark visible. Some spotting and offsetting with water stains near borders. Rumsey 3353.062. Pedley, Mary Sponberg Belle et Utile: The Work of the Robert de Vaugondy Family of Mapmakers, 267, state 1.